“Your airline should become an online retailer.” “You should be like Amazon, Netflix, Spotify or [name your hotshot online platform here].” Do you feel bombarded by these advice, too? I was in my car listening to a podcast when it hit me – I need to do a hands-on article about ancillary revenue ideas for airlines based on a real online retail case. My car was in the tire repair shop and I was waiting for the guys to replace my winter tires with summer ones. Yes, in June. 🙂 I’m usually late with this kind of chore, but this year has been really crazy with all the digital merchandising research we did at Diggintravel. Anyway, I had thirty minutes to kill at the repair shop, so I started listening to a digital marketing podcast. It was an interview with Nicolas Capuono, Vice President of Customer Engagement at Adore Me. He was explaining how they use digital innovation for their fast-growing online business. The company manufactures and sells lingerie, sleepwear, swimwear and other products. They wanted to disrupt the industry with an online-only approach based on a great (digital) user experience. The more I listened, the more I knew this is online retailing at its best. And of course, airlines and other online travel business can learn from it. Now, you’ll ask, how can I get ancillary revenue ideas for my airline and learn about digital merchandising from women’s bras? I know it sounds weird, but bear with me and read on. The first thing Nicolas mentioned in the interview was that Adore Me wanted to disrupt the lingerie industry. They went online-only with a business model that almost requires the ability to see and try the product. In addition, they wanted to provide a great online user experience – one where you can order online (with free shipping), try on at home, exchanges are free and returning is easy to do. However, the most relevant part (for airlines and travel) is how they use digital to provide a great user experience throughout the whole customer journey. Their digital retailing strategy has three main pillars, all supporting one goal – to provide a great user experience. Let’s look at each pillar and see what you can learn and apply to your airline digital merchandising. Their road to hyper-segmentation was gradual. They started by automatically sending daily emails to five (5) distinct customer segments. Gradually they built their predictive customer modelling skills and tools, and eventually, they identified numerous additional customer segments for their targeted marketing campaigns. Adore Me is currently communicating with more than 60 unique customer segments on a monthly basis. The result was a 15 percent increase in monthly revenue, 22 percent increase in average order amount and yearly active customers doubled. Personalization is still elusive for most airlines. 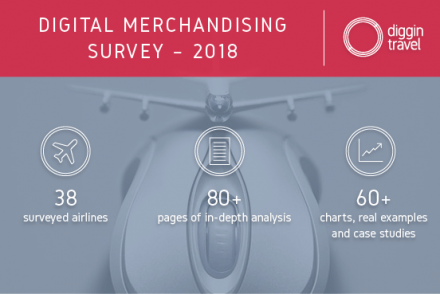 Our 2018 Digital Merchandising survey shows most airlines still do no or only basic segmentation when it comes to digital merchandising. This is why we advise you use a step-by-step strategy (like in Adore Me’s case) for your “personalization journey“. Start with identifying a few (up to five) key segments. Then gradually move towards smaller, even micro-segments. 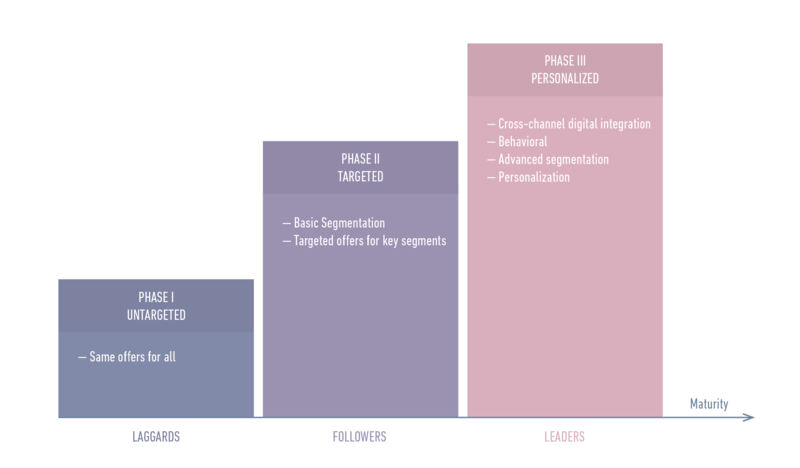 Personalization is basically segmentation done at a micro level (i.e., hyper-segmentation). 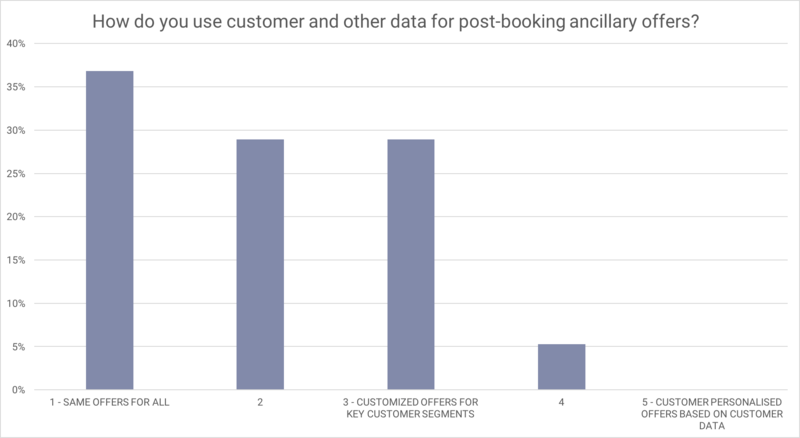 Adore Me’s segmentation examples can easily be used for ancillary revenue ideas for airlines, especially in the post-booking period, as all this data is available. You can read more about airline merchandising and personalization in practice in this article. This approach requires both the technology for automation and a data-driven mindset. Although the Adore Me marketing team is small (22 people), two marketers work solely on data-mining and customizing messages. When it comes to usage of AI, Adore Me goes even further. They use it to predict the engagement of the customer. For example, AI helps them to predict when the customer is becoming less or more engaged. Based on that they can offer the right product and the right communication to the right segment of customers. They then A/B test the whole process and see the results quickly. The important part is, they can see and analyze A/B test results on a customer segment level, so the result of their tests is not only version A was better than version B; it’s actually, version A performed better on this specific customer sub-segment. You should start exploring AI and machine learning for your airline digital merchandising. Combined with experimenting, it will allow you to understand your customers better and create better, more relevant offers. As per our research, the most advanced airlines (the Leaders) are already doing this. 4 out of 6 Leaders from the survey use machine learning for their ancillary offers; 3 use predictive analytics; 2 use AI and 1 uses recommendation engines. 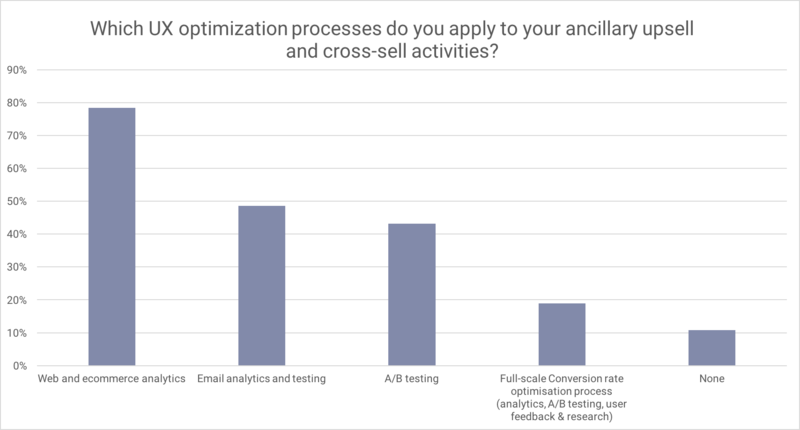 In addition, 4 out of 6 Leaders apply the full-scale conversion optimization (CRO) process for their ancillary activities. 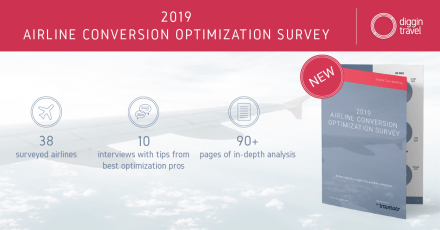 On the other hand, the majority of the airlines indicated they are still at the beginning with both CRO and using advanced data-mining and analytics. The last part of the Adore Me digital marketing strategy is the multi-channel approach. They want to be on a channel that is relevant and important to the customer. 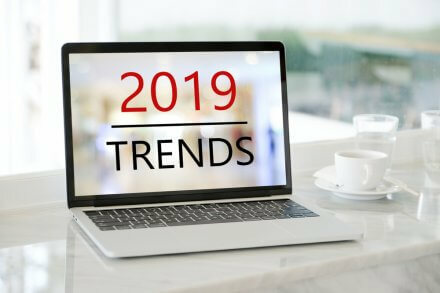 What they see is that some customers prefer the traditional channels like phone or email, while others only use newer channels like Facebook Messenger or WhatsApp. They don’t want their customers to choose one channel; they want to be present wherever their customers are. Adore Me is doing several pilots to embed Facebook Messenger throughout their customer journey. Some initiatives focus on the period before the order is placed, while others focus on after-order and customer support. All the pilots have one goal – to streamline customer interactions, making them seamless and improving the customer experience. In my recent interview with him, digital marketing “guru” Larry Kim talked about the even bigger impact of Facebook Messenger. Larry claimed messenger marketing can get you up to 30x improvement in conversion. In Nicolas’ words, customers who have just placed an order want basic communication. They want to know the order status – if the order has been placed successfully, if it has been shipped and delivered. Adore Me are using Facebook Messenger to send notifications that they used to send via email, SMS and push notifications. They also use chatbots for proactive communication and customer service requests. For simple customer service requests, they want to provide an immediate response, and they use chatbots and AI for that. For complex requests, they still use customer service agents. 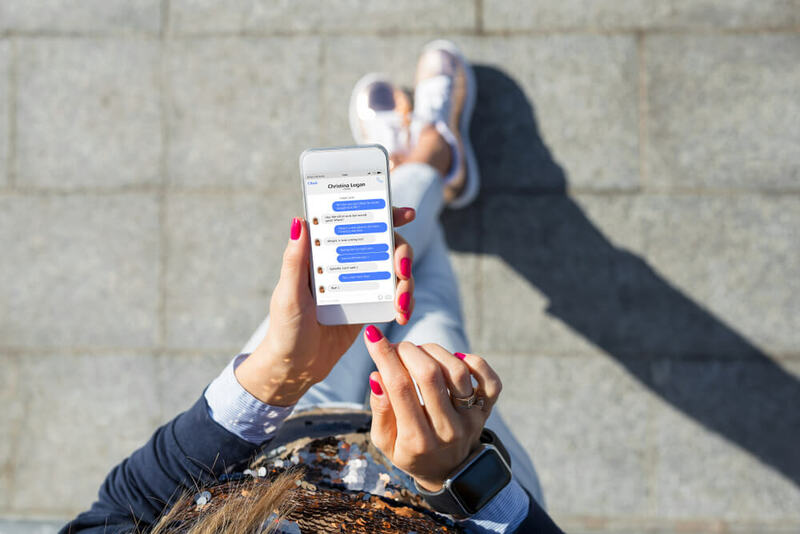 The key to “messenger success” is to connect both customer service and marketing communication in a seamless way. They want to enable customers, once engaged, to continue shopping within messenger. Airline chatbots are one of the biggest trends in airline marketing. However, most airlines are still using them for basic customer service scenarios. Using them for proactive, targeted communication during the whole customer journey can be the next step in your strategy. Imagine having booking confirmation, flight notifications and upgrade options all on your customers’ preferred messaging app. Add proactive info about check-in reminders, security line wait times, and gate notifications in the same message thread. Continue by telling your passenger when his bags will arrive on the carousel and providing preferred taxi or transfer cross-sell. Sound like too much? Complete automation for the whole flow is probably still not realistic for most airlines. However, a semi-automated approach using combinations of AI-run chatbots and customer support for your high-value customers can be the way to go. Another retailer, Walmart, did just that. They launched an exclusive personal shopping service that you can text. Jetblack is powered by automated bots and real live humans who’ll do their best to fulfill your requests. Membership is available by invitation only and costs $50 per month. Should you be judged worthy, then a 10-minute phone call from the service will suss out your favorite brands, family allergies, and frequently ordered items. Members text questions or specific shopping requests directly to the Wal-borg, where its network of AI-driven bots and professional buyers will scurry into action. Want More Ancillary Revenue Ideas for Airlines? Check out our 2018 Digital Merchandising White Paper with more than 60 charts, case studies and examples of ancillary revenue and digital merchandising in action –> GET YOUR COPY NOW! “Imagine having booking confirmation, flight notifications and upgrade options all on your customers’ preferred messaging app. Add proactive info about check-in reminders, security line wait times, and gate notifications in the same message thread. Continue by telling your passenger when his bags will arrive on the carousel and providing preferred taxi or transfer cross-sell.” – and this only the start. Imagine the following 2 scenarios. 1) Flight disruption – Passenger gets a proactive notification/message of their flight cancelation/delay and immediately the passenger could engage in a messaging conversation (in their preferred msging app) to book next flight, make a claim, get info on emergency accommodation, get meal concessions etc etc. This removes the inevitable panic and long call centre wait times to resolve. This use case could be resolved with a seamless tango of automated bots & live agents via messaging. Win-win for airline & passenger. 2) Ancillary upsell – passenger receives checkin reminder on the morning of their departure, with an offer/reminder that they haven’t chosen a seat, or bought a meal, or lastminute seat upgrade etc. These could all be resolved in a 2-way messaging conversation at the convenience of the passenger. No need to resolve immediately. Everyone is busy. Messaging allows you to have a long-lived conversation to address these use cases at times most convenient for the passenger. Customer centricity at it’s best. Isn’t that Facebook deliverability number insane? Complete game changer. Glad the interview was useful for you!